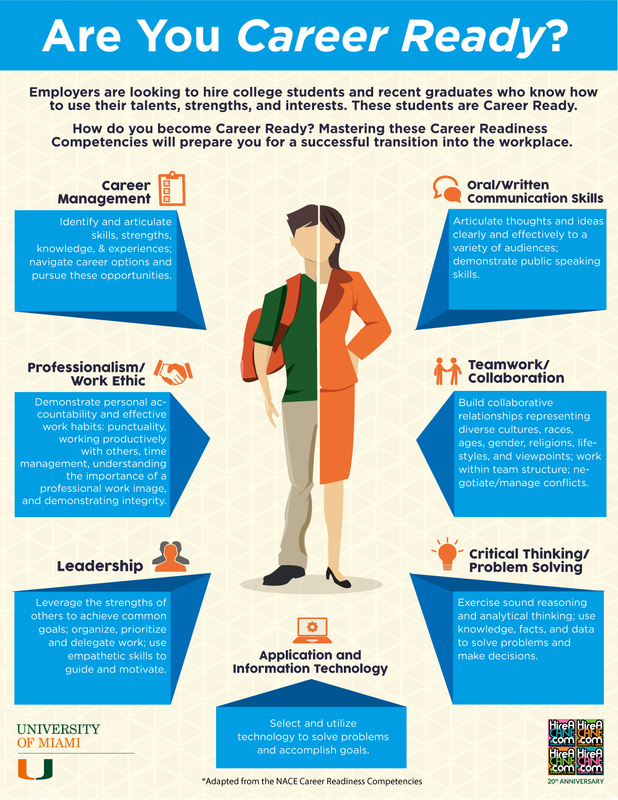 Courtesy of the National Association of Colleges and Employers. Get your professional dress ready (typically business casual or business dress). Find out which employers are attending. Research the employers you want to meet with. Prepare specific and general questions. Walk around to meet employers alone—you might have friends at the fair who you check in with, but don’t travel as a posse. Limit your give-away item collecting. Introduce yourself with a smile, a handshake (if recruiter offers a hand), and a few relevant details about yourself, your education/experience, and/or interest in the employer. Be strategic—talk to your top three employers first, others if you have time. Take quick breaks between rounds of visits to freshen up and take a breather. Don’t dominate recruiters, be mindful of other students waiting in line. Ask about opportunities and next steps if there are specific openings. Wait for cues from recruiter regarding resumes—some will be collecting them, others might direct you to follow up by e-mail, or apply online. Get the appropriate contact information and/or ask for a business card. Thank recruiters after speaking with them. Take notes as soon as you walk away from a table. Take a few minutes immediately after fair to sort through your notes and make a list of follow-up items. Follow up with online applications, or by sending a resume and cover letter to the appropriate contact. Reach out via e-mail or by telephone to reps who were not at fair, but who work with your level of education/field. Set up informational interviews with individuals at companies/organizations of particular interest to you, and with alumni in these organizations. Check in with your career office with specific questions. Kathy Douglas is the Associate Director Career Development Office, Yale School of Forestry & Environmental Studies. By Bob Orndorff. Courtesy of the National Association of Colleges and Employers. You control your career destiny! Just going to class and picking up your diploma after four years doesn’t cut it. You need to become active on and off campus. Keep your grades up—Employers and graduate schools want candidates with good grades. That will probably never change. Doing well academically not only proves that you have a good knowledge base, but indicates a strong work ethic—a trait that employers value. Identify your interests, skills, values, and personal characteristics—The first step to clarifying your career goals is to go through a process of self-assessment. Visit your career center and take advantage of the self-assessment instruments it has to offer. Actively explore career options—You owe it to yourself to find a career that enriches your life, not one that brings you down. Actively exploring careers means talking with professionals in occupations of interest and observing professionals on the job. Your career center probably has alumni and other volunteers who are willing to talk to you about their careers. Also, attend any career expos, career fairs, and career speaker panels that are offered. Become active in extracurricular activities and clubs—Active involvement in activities and clubs on campus is highly valued by employers and graduate schools. Joining a club is fine, but becoming active within that club is what matters most. Become a leader, hold an office, or coordinate an event. You will develop your skills in leadership and teamwork—skills that recruiters covet! Get involved in community service—It’s important that you begin to understand and appreciate the importance of giving back to your community, and that you live in a larger community than your college or hometown. Typically, students look at community service as a chore. After they’ve served, however, it’s usually one of the most rewarding experiences they’ve had! Recruiters love to see that you’ve volunteered to help in your community. Develop your computer skills—Take advantage of the computer courses and workshops your college offers. You can also learn a lot by just experimenting with different software packages on your own. Finally, you should learn how to develop your own web page or web-based portfolio. There are many web-design software tools that make it real easy to develop your own web page! Contact your college’s information technology office to see how to get started. Develop your writing skills—Over and over, company and graduate school recruiters complain about the lack of writing skills among college graduates. Don’t avoid classes that are writing intensive. Work at developing your writing skills. If there is a writing center on campus, have them take a look at your papers from time to time. Remember, the first impression you give to recruiters is typically your cover letter or personal statement. Complete at least one internship in your chosen career field—More and more, internships are the springboards to employment and getting into graduate programs. Many recruiters say that when they need to fill entry-level jobs, they will only hire previous interns. In addition to making yourself more marketable, internships also are a great way to explore careers and determine whether or not certain careers are for you. When you work for a company as an intern for three to four months, you get a really good feel for whether the field (and company) is one in which you want to work day in and day out! Gain an appreciation of diversity through study abroad, foreign languages, and courses—We are now, more than ever, working within a global work force. For you to be successful at work and in your life, you must stretch yourself, and learn about people and cultures different than yours. Take advantage of the wonderful study-abroad opportunities and the courses relating to diversity. This is your time to travel! Most people find it harder to take time to travel as they begin their careers and start families. Connect you with alumni mentors. Remember, you control your career destiny. Don’t wait until your senior year to start realizing your goals. Your career train is on the move. Jump on board now so you can reach your destination! Many undergraduate students start the career decision-making process by selecting a major based on the subjects they enjoyed in high school. For example, you may have chosen to major in engineering because you were “smart” in high school or strong in math and science, but you really don’t know much about the engineering field. And then, you wonder why you’re not more interested in the engineering coursework and field experiences. The problem isn’t engineering. The problem is that you’ve formed career goals in isolation. You didn’t consider the environment you would be working in, the physical location of the organization you might work for, the skills you want to develop and build on, or the way you hope to grow a professional. “Career goals should not be formed in isolation. You must take into account all of your responsibilities (personal and professional), and be sure to account for your own well-being. This includes physical and mental health.” Blank encourages his clients to integrate their career and personal goals in order to set themselves up for success. Career goals, increasingly, need to be formed holistically. Gone are the days when choosing a career was simply a matter of matching your best school subject to an industry. The market is volatile; new opportunities are being created and other avenues are becoming less viable. A law career isn’t the safe choice it once was, and the nonprofit world has expanded to include diverse organizations tackling new social issues. It’s more common that professionals will relocate to a new city for a job opportunity, and more workers than ever are changing jobs and moving to new sectors over the course of their careers. Students are facing the so-called “paradox of choice.” Research has demonstrated that if you are presented with more opportunities, decision making becomes more difficult and satisfaction less likely. When you step into a career development office today, you’re faced with a much broader set of options than you would have been 30 years ago. You could go to medical school in your hometown or spend two years in the Peace Corps and teach grade school students in Lithuania. You could go to graduate school for computer science or launch a start-up with friends based on ideas for a new app. In order to make these decisions, you must consider not only what talents you have, but what kind of life you want to lead. What skills do I have and want to develop? What type of work environment might best fit my temperament? What type of diversity do I hope to have in my work environment? How is the industry I’m considering expected to evolve in the next few decades? What city, state, or country might I want to live in? What have my career goals been and how have they changed? What role would I like technology to play in my career? How important is stability to me and how willing am I to take risks? Each of these questions will take time to answer as you develop more clarity in your identity and values. Attempting to build your life looking only through a narrow lens of career is bound to work against your happiness. Look into internship and co-op programs that allow you to get full-time work experience before graduation so you can test your interests in specific careers. Melanie Buford is a writer and career counselor who has lived and worked on both American coasts and abroad. She is the program coordinator and an adjunct instructor at the University of Cincinnati. Melanie writes both fiction and non-fiction, and is in the process of developing a 70,000-word fictional novel. Highlights: What Happened to the College Class of 2014? More than half of bachelor’s degree graduates were employed full time. 16.4 percent were continuing their education. Those earning degrees in career-oriented majors were most likely to be employed full time, while graduates in the liberal arts and sciences were most likely to aim for a place in graduate or professional school. Approximately 14 percent were still seeking employment; nearly 4 percent were still seeking to continue their education. Overall, the median starting salary was $45,478. 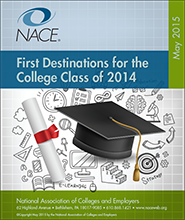 NACE’s Class of 2014 First-Destination Survey is the first-ever national survey focused on outcomes of new college graduates. It represents the inaugural survey in what is an annual initiative to provide clear, concise, and consistent data on the outcomes associated with a college education on a national scale. More than 200 colleges and universities nationwide, representing 274,000 graduates—including more than one-quarter of a million bachelor’s degree graduates—provided data for Class of 2014 associate and bachelor’s degree graduates. (Class of 2014 is defined as those graduating from July 1, 2013, through June 30, 2014.) Overall, data were reported for nearly 175,000 bachelor’s degree graduates, making this study the most comprehensive view of bachelor’s degree outcomes available. The study provides data for 31 broad disciplines and 190 majors. Beginning with the Class of 2015, the survey will include outcomes data for advanced-degree graduates. The Class of 2015 survey, which captures data for those graduating July 1, 2014, through June 30, 2015, is currently underway. Data will be collected through December 30, 2015, reported to NACE through March 2016, and published in spring 2016. Use keywords in your summary statement. Many employers search by keyword, so use keywords—technical terms and skills—from your field. Not sure what your best keywords are? Find profiles of people who hold the job you’d like to get and see which keywords they use. Write short text. Describe your skills and abilities in short bursts of keyword-rich text. Use bullets to separate information. List all your experience. LinkedIn, like other social media, helps you connect with former colleagues and networking contacts who may be able to help you find a job opportunity. It also gives an employer searching to fill a job a description of your expertise. Ask for recommendations. Collect a recommendation or two from someone at each of the organizations where you’ve worked. Don’t forget to get recommendations for internships you’ve completed. Refresh your news. Update your status about major projects you’ve completed, books you’re reading, and professional successes you’ve had, at least once a week. This lets your professional contacts know what you are doing and serves as a sign of activity for potential employers. Employers expect to hire 8.3 percent more new college graduates from the Class of 2015 for their U.S. operations than they did from the Class of 2014. 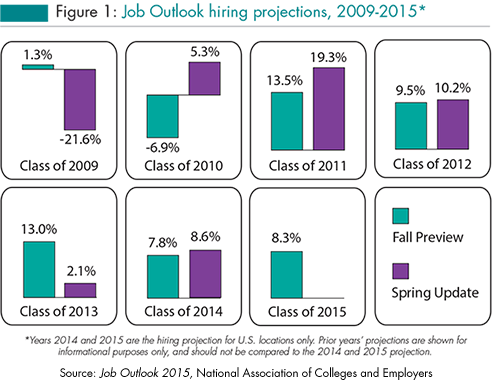 As the economy has improved, many organizations have increased the number of new college graduates they bring on board. Employers also expect to “sweeten the pot” some for their new hires. Overall, respondents said they plan to raise starting salaries to new college hires by 3.6 percent. What Is a “Good Fit” and Do You Have It? Culture: Think back to all the encounters you have had with a potential employer. Think about the e-mail correspondence. Think about how you felt at the interview—not how you did, not how your performance was evaluated. Also, think about how everyone else was acting during the event. Did you like the recruiters’ responses? Did you feel uncomfortable? If you judged them on their performance, what grade would they get? Also, keep in mind that office visits can give you further information if the company is a good fit or not—go to office visits to help you decide. Priorities: Part of finding the right fit is knowing your own priorities. Create a priority list before the recruiting process even begins. Write down what matters to you: Flexible schedule? Location? Team culture? Open to ideas? Future career opportunities? Rank them. Match the ranking against what you think the job can offer you. Also, be mindful of what you are doing now that affects your future career transitions. Take an Inventory: A right attitude can be the first step in being part of the good fit. Do you have a habit of talking about what irks you to anyone that will listen? If so, this could easily disrupt a team dynamic and distract from the work you do. Consider what you can give before you judge what you get. Ask Real Questions: You have an opportunity during interviews and office visits to get as much information as you can before having to make a decision. Do you care about the management style of your direct supervisor? Do you want to know how work is evaluated in the company? Ask! Many times your authentic questions show your sincerity and real commitment to the potential employer. And guess what? That is what makes you a good fit! Dawn Shaw is a career consultant in MPA Career Services at the McCombs School of Business, The University of Texas at Austin. Grad School: To Go or Not to Go? What do you truly want to do? What excites you more than anything? If it’s a profession you absolutely, positively must pursue, and it requires advanced education, then you’re probably an excellent candidate for further education. “You go to graduate school to become an expert in a certain area or to be a professional in certain industries, like law, medicine, or engineering,” explains Cindy Parnell, director of career services at Arizona State University. Graduate students find out very quickly that their days of frat parties, general education courses, and hanging out with friends are over—graduate school is, well, about school. Also consider your post-undergraduate life plans. Are marriage and family in your immediate future? Graduate school can put a huge financial strain on a young couple already facing student loan debt, not to mention the burden of the time you’ll be spending studying. Be sure you—and your family—are ready for the added responsibility of a few more years of schooling. Not every profession requires an advanced degree, so do some research on potential career opportunities before committing to more education. “Students run the risk of thinking today that grad school might be the answer. Depending on the program, you want to have the fieldwork experience as well as grad school. If you go on to grad school without having any fieldwork experience, you run the risk of being over-educated [and under-experienced],” says Shayne Bernstein, associate director, career development services, at Hunter College. If you do plan to work before going back for that advanced degree, will more education help you move up the ranks at your company? Have you landed a job in your undergraduate area of study, and now you’re thinking you want to enhance what you’ve learned, or pursue a totally new field? Depending on your professional career path, advanced education may help you reach your career goals. Can’t think of what else to do next? Don’t think of graduate school as a way to hide from the job search. You face wasting a lot of resources. Bernstein suggests giving careful consideration to your decision to pursue graduate school. It’s that time of year again! The Fall Job and Internship Fair is right around the corner on Wednesday October 1, 2014. Career and job fairs provide candidates with an excellent opportunity to meet employers from a variety of industries and receive first-hand information about the organization and available full-time and internship positions. These fairs allow employers the opportunity to view a large number of potential candidates and promote their organization, which aids in the pre-screening process and gaining familiarity with students at the fair. A good resume is paramount to the job search. It is the first glance that an employer will get of your background and credentials, so you want it to be neat and tidy. You want to make sure you include your most recent employer and possibly take out any information that may be irrelevant. For help with your resume you can find helpful information on the Career Services website, or you can always schedule an appointment with a Career Services professional. They can guide you step by step; making sure everything is in order and giving you useful suggestions on how you can improve the professional appearance of your resume. Once you have your resume in tip-top shape, you should print copies to hand out to the employers you speak to at the Job Fair. It is important to remember that the Job Fair is just like a job interview: you want to make the best first impression possible. Here are a few of the basic tips on professional attire. Wear nice dress pants that are clean and pressed with a buttoned up shirt and tie. Choose a solid-color button down shirt that is wrinkle-proof. If you can’t afford a suit, purchase a single-breasted, black, two-button blazer that will go with several of your dress pants. Black leather laced shoes are another “must have” that can be worn with a variety of outfits. If you don’t own a suit, you could wear a skirt (knee length or below) with a sweater set or nice blouse. Avoid heels unless you need the height and are comfortable wearing (and walking!) in them. Remember – closed-toed shoes. Ideally, blouses should not reveal any cleavage or undergarments (bra straps, etc.). Once you have finalized your resume and selected your outfit, the final thing you need to complete is your homework! Research the companies that will be at the Job and Internship Fair — learn more about the organizations and the positions that they are offering. This will help you determine who you want to visit with that day. It is a great way to make a good impression and you will be more relaxed knowing you will have something to talk about with the employers. The company representatives will also be impressed that you took the time and effort; just another way to stand out in the crowd! A full list of the employers attending can be found on the Career Services’ website – and if you log into PRO, you can view all of the information submitted by the employers, including information about their organization and the types of positions which they are hiring. With a little preparation and initiative, you can make a great impression at the Fair. The staff in Career Services hope to see you this coming Wednesday, October 1st!